These 365 dynamic devotions will inspire readers that they can reign over every adversity, lack, and destructive habit limiting them from experiencing the success, wholeness, and victory they were destined to enjoy. Joseph Prince, seen across the world on his television broadcast Destined to Reign, will inspire you to live every day in the joy and peace of God by depending upon His grace to give you favor, wisdom, and peace no mater what circumstances you face. Through these daily devotions, you'll begin to realize the completeness of Christ's work on the cross including freedom from anxiety, sickness, fear, and lack-a much needed book in a world of uncertainty. This is a great gift for men and women alike, Destined to Reign devotional provides short, powerful devotions bringing encouragement and hope every day of the year! Destined To Reign Devotional by Joseph Prince was published by Harrison House Publishers in October 2011 and is our 9320th best seller. The ISBN for Destined To Reign Devotional is 9781606833551. 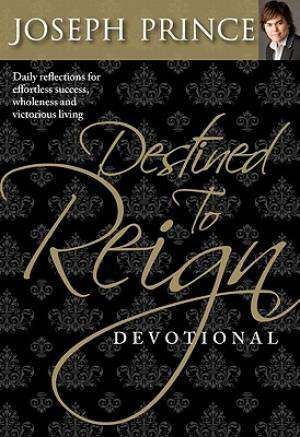 Be the first to review Destined To Reign Devotional! Got a question? No problem! Just click here to ask us about Destined To Reign Devotional.